I’ve suspected it for a while. I’ve jokingly called him by the name. But now I have proof. I’m married to The Hulk. There's no denying it. My husband is the hulk. 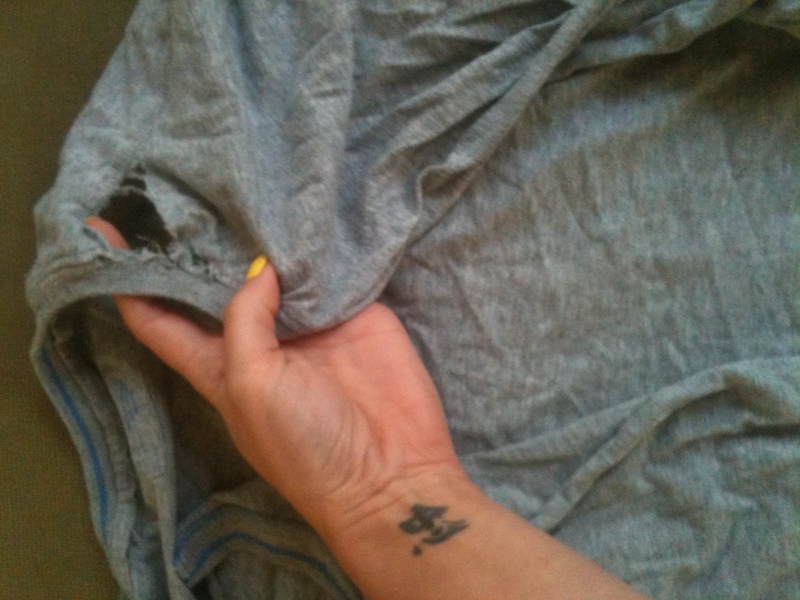 Me: because what is a ripped up shirt doing in the laundry…with HOLES in it? Now he’s just avoiding the question…something the hulk would do when confronted. I’m sure. Me: are you going to rip another one? did I anger the Hulk with my questions? How exactly did this happen? 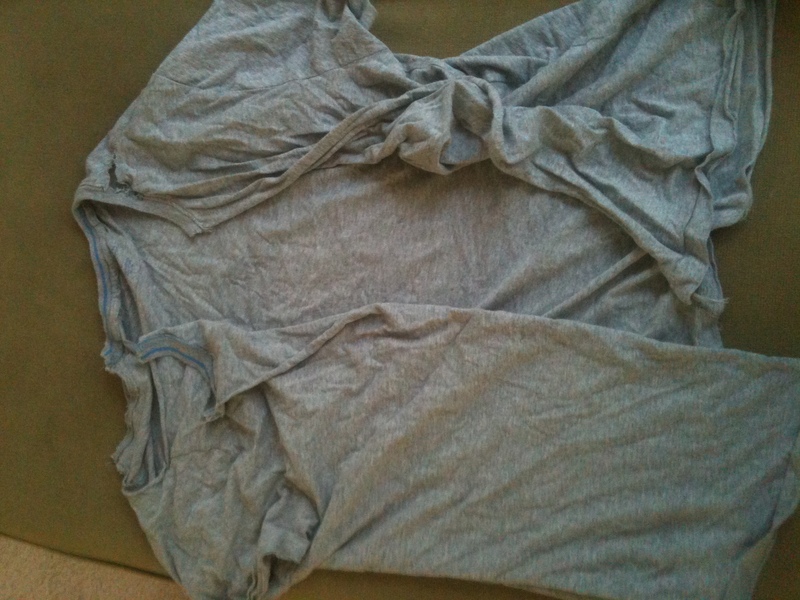 Chris: I put it on the other day, and it didn’t fit, it was just like…it didn’t fit…it was like stretched out. Me: So you did rip it like the Hulk? I really didn’t expect that answer, I really expected you to be like “oh no, it was something else, or whatever” and you actually just ripped your shirt off because you ARE the freaking hulk. So what angers the hulk? I didn’t realize it was wardrobe malfunctions that turned you into the hulk, and you’re wearing green right now which is pretty awesome. I really wish I could upload the actual audio of this conversation. It’s so much funnier when you’re not reading it. Yes, That is a picture of toast with cream cheese on one side and butter on the other. NOT on purpose. Well, you see I wanted two pieces of toast to cover in cream cheese because I hadn’t eaten all day and it was kind of getting to me. 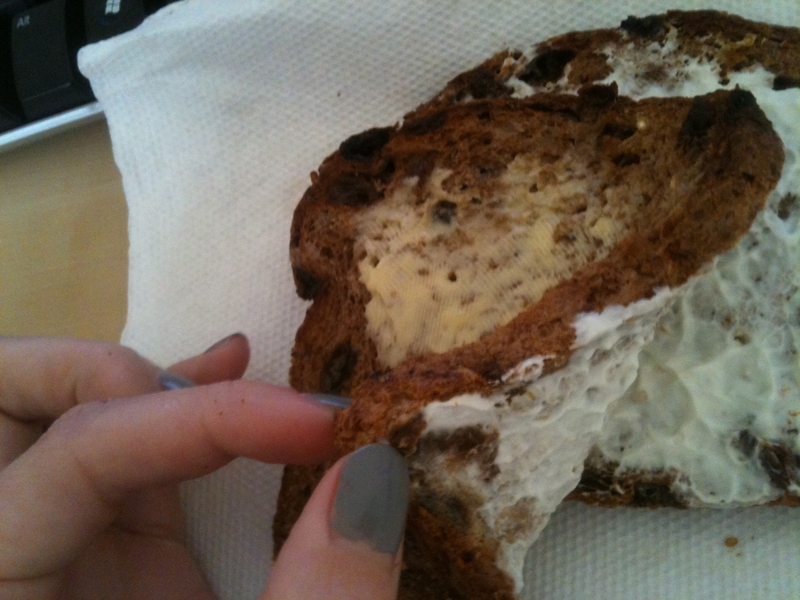 But I accidentally got 3 pieces out because the bread stuck together because it’s refrigerated bread and it does that. So I decided to cream cheese 2, and butter 1. I made the first two, cream cheesed them and put them on the paper towel cheese to cheese so I would have room for the 3rd piece. I laid the single piece to the right of the cream cheese sandwich, and then I BUTTERED THE BACK OF THE CREAM CHEESE TOAST. I didn’t even notice right away either. I just saw the blank bread on the right and thought hey, where did that bread come from? This is what happens when people stress me out and I don’t get enough sleep and then I wait till 3pm to eat. Or maybe it was me switching to 1/2 caff coffee 2 days ago. Oh, if you’re wondering if it was delicious. Yes, it kind of was. Let me preface this by saying me and my fiance just went to the Houston area for a visit. I saw funny things. Tiger at the hotel – There was a hotel being renovated on the side of the highway. One day, we drove by and there was a table sitting outside of one of the rooms and it had a tiger statue on it. That struck me as odd. A freakin tiger? Why did they put it outside? Does that mean there are tigers in the rooms? What kind of hotel is this? The next day, we drove by again, and that tiger was on the roof. At the very front of the building at the point of the roof. OH MY GOSH. What is going on? Weird. I am disappointed in myself for not having pictures. Handicapped room – We get to the hotel, and it’s not busy at all. DUH, it’s a Wednesday. But we get to our room and realize it’s a handicapped room. It has a little sign on the outside of the door stating so. Also, I didn’t see any difference in that room vs any other room. Except maybe the bathroom door was bigger. Why did we get a handicapped room? I don’t understand. Virgin tissue paper – Yes. The tissue paper was “made of virgin materials”. There’s a joke there. Find it. Update: I decided not to be so angry at solitaire anymore since I won 3 times in the last two days. So consider this an apology to solitaire. It’s an impossible game and I swear it’s missing cards. I know, it’s on the computer so it is sure to have all the cards, but it’s like a trick. The computer makes sure it’s unwinnable. People who win it often are using voodoo magic or something. I have won it a few times in my life but it’s so rare it makes me think that the computer just let’s it happen 1 in a million times so that I keep playing hoping that the next time I play I’ll win it. But I don’t win. I try and try and fail and fail. I sit here until my eyes cross trying to figure out how to make it all work and it doesn’t. I hate it when I get on a roll and am moving cards and filling up those 4 spaces at the top that I don’t know what to call and then all of a sudden, I’m stuck. No more moves. WHYYYYYYYY!!!??? And what’s with Spider solitaire? What does that even mean? There are no spiders. That’s a weird game, but it’s winnable. So I do play that when I’m mad at regular solitaire. But I only play the single suit.. I’m not brave enough to try more than one. I’m not even sure how that would work.. Probably another winless game for me. And then there is NERTZ. Team solitaire you play with a partner. No computers involved. That game ROCKS. So fun. I don’t feel like explaining it because I’ve lost my steam, but it’s fun and you should figure out how to play or make up your own rules and then teach others to play and then when two NERTZ players from different places come together to play they will be like “WHAT KIND OF GAME iS THIS!! THAT’S NOT THE RULES!” and then that game will become impossible to win because no one will agree and then there will be another solitaire game that I hate. But for now, it still rocks. PS. Sorry I’ve been so sucky at this blogging thing lately. I’ve got blog drafts, sitting unfinished. It’s very depressing actually. My head has awesome stuff in there, but it’s been hard to sit down and get it all out into words. PSS. Shout out to spell check, because apparently I didn’t know how to spell Solitaire so THAT would have been embarrassing since that’s what this whole thing is about. Why don’t they ever have any one dressed up a baby Jesus? Would that be blasphemous? I’m not sure where that line is. People dress up as Santa all the time, but santa is no supreme being and he has nothing to do with the meaning of Christmas. Instead of having Santa at the mall, they should have Nativity scenes set up and people can visit and ask Jesus for things but the difference between asking Santa something at the mall and asking Jesus something at the mall is that Jesus can actually hear you and answer you because it’s called PRAYING. Christmas should not be a time of stress, or struggle, or shopping until you’re in debt. It should be a time of reflection on what Jesus’ birth means to your life. If you don’t know what the birth of Jesus means to you, then you should pick up the Bible and read. Jesus’ birth changed your life whether you realize it or not. First. I hope you get the title. If not, you’re missing out on the best movie intro. OK. Probably not the BEST, but a really good one. Second. This post is about littering and how incredibly annoying I find it. If you litter, STOP IT. If you litter and I see you, I might ram your car with my tiny car and then sue you for making me wreck while I was being irritated by your disrespect of the earth. Seriously, it is one of the MOST frustrating things in the world for me to be driving behind you and watch you toss a fast food bag out of the car window. REALLY?! You can’t leave the bag in your car until you arrive at your destination? Does the place you’re going not have a trash can? Holy crap, I don’t even care if you recycle it, just stop throwing it out of your window!! Maybe you think you are helping keep those community service kids in business, but there’s enough accidental trash on the road as it is, it doesn’t need your deliberate garbage added to it. So just stop. Don’t litter. They (someone, I don’t know who) makes cute little car trash bags for you if you’re too good to hang a grocery sack from your gear knob thing. Whatever you do that makes you stop throwing trash out of the window, do it, so I don’t have to yell at you inside my car knowing you can’t hear me which makes me even more irritated but slightly relieved since I’m actually afraid that if I do yell you might shoot me.